One of my pet peeves at our house is buying a bunch of bananas per my family's request, only to realize at the end of the work week that no one has eaten any. When I ask my boys to grab a banana for a weekend snack, they scowl and complain that the bananas are just too ripe and mushy for them. As a result, it leaves me with a bunch that have nowhere else to go but my freezer. A shelf in my freezer had finally reached it's breaking point where I just needed to use up these bananas. Thankfully, my fall baking bug set in and I was happy to give these sweet bananas a home! Preheat oven to 350 degrees. Lightly grease a 9x13 baking dish with non-stick cooking spray. In a bowl of a stand mixer, cream together butter and sugar on medium speed. Add eggs one at a time until incorporated. 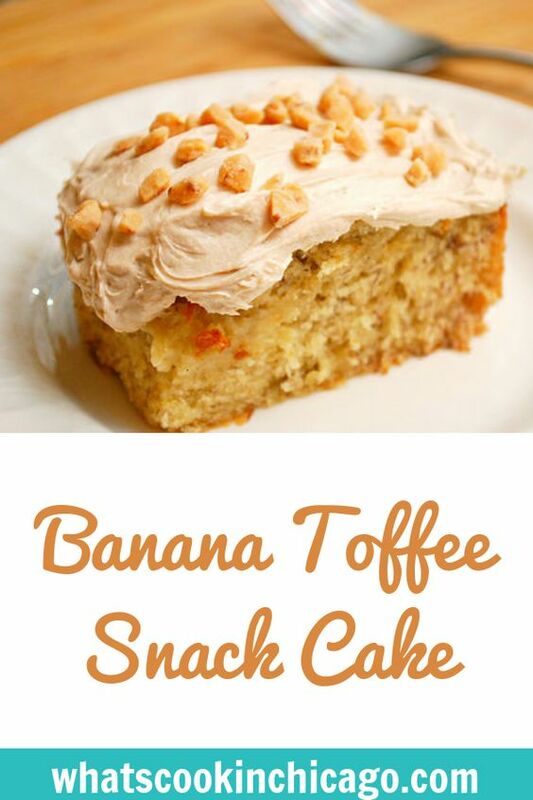 Add bananas and extracts. Switch the mixer to low speed and slowly add the flour mixture to the stand mixer bowl until incorporated. Remove from stand mixer and stir in toffee bits by hand. Transfer batter to prepared baking pan and spread evenly. Bake in preheated oven for 20-25 minutes or until toothpick inserted comes out clean. Cool cake completed on a wire rack. While cake is cooling, prepare the frosting. In a bowl of a stand mixer, cream the cream cheese and butter until fluffy. Slowly add the powdered sugar and caramel sauce. Mix until fully incorporated and frost cake as desired. 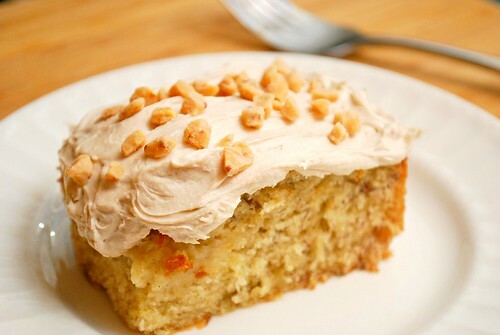 Garnish frosted cake with toffee bits before cutting and serving.